German author; born at Sandersleben July 20, 1778; died in Berlin Oct. 16, 1855; son of Rabbi Joachim Heinemann. In 1808 he was appointed secular member of the consistory of Westphalia. On the dissolution of that body he acted in Berlin as inspector of a teachers' seminary, which had but a short existence, afterward he became the principal of a school, and finally devoted himself entirely to literary work. From 1817 he published "Jedidja," a "religious, moral, and pedagogical periodical," of which eight volumes were issued (Berlin and Leipsic) up to 1831, and which subsequently appeared as "Neue Folge" (Berlin, 1833), and still later under the title "Allgemeines Archiv des Judenthums: Zeitschrift für Religion, Kultus, Geschichte, und Literatur" (Berlin, 1842-43). 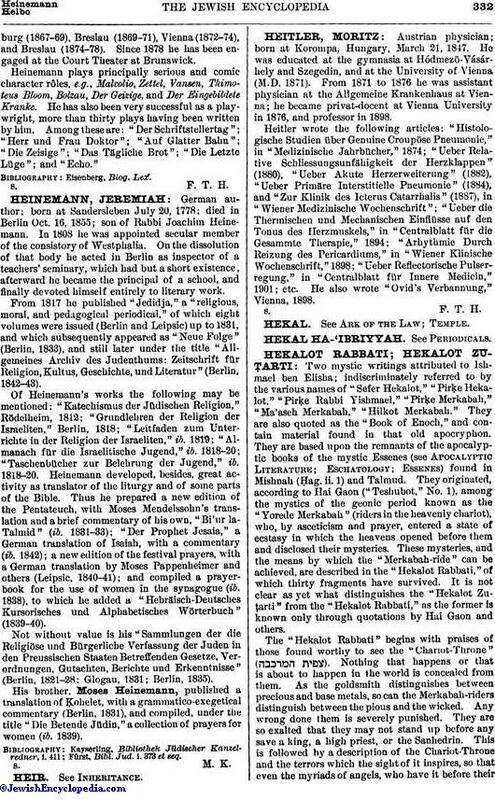 Of Heinemann's works the following may be mentioned: "Katechismus der Jüdischen Religion," Rödelheim, 1812; "Grundlehren der Religion der Israeliten," Berlin, 1818; "Leitfaden zum Unterrichte in der Religion der Israeliten," ib. 1819; "Almanach für die Israelitische Jugend," ib. 1818-20; "Taschenbücher zur Belehrung der Jugend," ib. 1818-20. Heinemann developed, besides, great activity as translator of the liturgy and of some parts of the Bible. Thus he prepared a new edition of the Pentateuch, with Moses Mendelssohn's translation and a brief commentary of his own, "Bi'ur la-Talmid" (ib. 1831-33); "Der Prophet Jesaia," a German translation of Isaiah, with a commentary (ib. 1842); a new edition of the festival prayers, with a German translation by Moses Pappenheimer and others (Leipsic, 1840-41); and compiled a prayer-book for the use of women in the synagogue (ib. 1838), to which he added it "Hebräisch-Deutsches Kursorisches und Alphabetisches Wörterbuch" (1839-40). Not without value is his "Sammlungen der die Religiöse und Bürgerliche Verfassung der Juden in den Preussischen Staaten Betreffenden Gesetze, Verordnungen, Gutachten, Berichte und Erkenntnisse" (Berlin, 1821-28; Glogau, 1831; Berlin, 1835). His brother, Moses Heinemann, published it translation of Ḳohelet, with a grammatico-exegetical commentary (Berlin, 1831), and compiled, under the title "Die Betende jüdin," a collection of prayers for women (ib. 1839). Fürst, Bibl. Jud. i. 373 et seq.